I review a lot of green/organic beauty products. Not very many of them make the cut to be included in my reviews because they are not special enough and they do not make the cut. Karma Organic Spa however, blew.me.away. How is this you ask? Well, for starters, they make nail polish and nail polish remover that is ORGANIC!! How about that? No formaldehyde, toluene, DBP and they are cruelty-free! Amazing! Karma is one of the first in the US to have this Polish Remover available. Ok, so you now know that is almost safe enough to eat but hey, will it actually remove my polish? OH YEAH it will! I was delighted! I had the same polish on my toes about probably 3 months and it took no more effort or time than my traditional checmical-laden remover to take off! The solution is a little oily but duh, its made from soybean oil! It is lovely! What else did I love about it besides the effectiveness? The fact that my nails looked healthy and revitalized when naked rather than parched and nasty after using a traditional polish remover. I chose the lavender and I am seriously putting this in my top 3 favorite beauty products list! 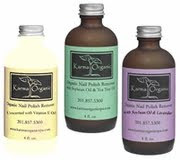 Karma Organic Spa also makes chemical-free nail polish!! With colors like Dirty and Flirty, Life's a Beach and Nice N Naked who wouldn't want to use these beauties!? This contest will end on June 10th at NOON EST. Good Luck! It is open to US and Canadian entrants! I like Lavender remover and Sun Kiss Coral and Sandlewood Pilishes. I found your site whie searching for a giveaway. I would like the Unscented with Vitamin E polish remover. And the Sun Kissed Coral and Bronze Star polish. I found your site a long time ago. I'm not sure how! I would choose the Lavender Nail Polish remover and the polish in Hot Red Project Ladybug and Honey Glace. I follow you on twitter (Katlovesmath). I like Super Savvy Mommy on facebook (Kat McLean) #1. I like Super Savvy Mommy on facebook (Kat McLean) #2. I would love the lavender nail polish remover and Olivia orchid & twinkle twinkle periwinkle nail polish removers. I would choose the Unscented Nail Polish Remover and the colors Pink Opal and Life's A Beach. I originally found your site by doing a search for giveaway blogs. I entered the Espadrilles Shoes giveaway. I'd love the Crushed Velvet and French Beige polish and Lavender polish remover. Thanks! I'd want the lavender scented remover and the You Set My Heart Ablaze and Velvet Rose nail polish. Winey the Pooh and Don't Teal my Heart. Two funky colors for different seasons! I would love the Lavender polish remover, and the "Wicked and Wild" and "Baby Bloom" polishes. Lavender remover, Cafe au Lait and Honey Glace polish. I would choose the shades Dirty & Flirty and Hysteria and the Lavender scented nail polish remover. Thanks! I would choose the Tea Tree Nail Polish Remover & the 2 shades I'd choose are Party Hearty & Pink Passion! Oooh! Their colors are beautiful! I love that their removers don't smell so chemicall-y! I'd pick the Tea Tree scented remover and "Chainmail Charm" and "Sun Kiss Coral" polishes! So pretty!!! I just subscribed (and confirmed) to your email newsletter. I love the colors of the nailpolishes. Although I'm now a subscriber, I originally found your site through Prizey. Entry #1 --> I subscribe to your blog feed via email through Feedburner. Entry #2 --> I subscribe to your blog feed via email through Feedburner. I'd like Tea Tree Nail Polish remover and Pink Flamingo & Dirty and Flirty. thanks. Maggie - this is cool.I was just doing research on nail polishes so I could paint Sarah's piggies. :) Great find! I'd choose unscented polish remover. My other choices are Park Avenue Purple and Sparkling Sherry.